We’re continuing the interview process with our awesome authors. 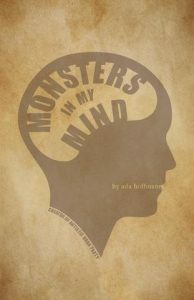 Azzia Walker, our operations manager, got to know Ada Hoffmann, author of Monsters in My Mind and The Outside, which is coming in June 2019 from Angry Robot Books. Q. What got you started with MONSTERS IN MY MIND? A. I started publishing short fiction in 2010, and by 2015-ish I had an amount of it out there that I felt was a book’s worth. I always loved the idea of having a short fiction collection of my own, so I started experimenting with themes that could tie together big chunks of my work and with different ways of arranging the stories and poems. When Dani Alexis Ryskamp beta read the manuscript for my novel THE OUTSIDE, she offered to publish it. I wanted (and, eventually, got) an agent and a bigger press for the novel, but I had been playing with the collection idea for a while at that point and had been struggling with where to send it, so I asked if we could do that instead. I liked the idea of publishing MONSTERS with a group of neurodivergent publishers who “got” my work. I actually changed the entire story order for the NeuroQueer Books imprint. I asked myself: how did the stories and poems engage with the idea, literal or metaphorical or subtextual, of being neuroqueer? I knew what stories I wanted to start and end with, and between them I was able to order the works in a way that charted a satisfying path between different ways of engaging with that concept, like a meta-plot. Q. Was there anything that surprised you about the stories or the characters as you got further in? A. Not a lot – most of the stories were already polished and published before I assembled them. Even the new ones had already been through beta reading and revisions. The surprises were mostly to do with how well the stories fitted together. I was surprised how much of my work I could fit into the structure I’d come up with, even if it had nothing to do with neurodiversity at first glance. It also surprised me which stories I ended up dropping. I had a couple of published stories that I think are great stories, and that even engage with neurodiversity and mental illness themes more directly than some of what made it in. But they didn’t fit the meta-plot – they contradicted what I felt like the meta-plot was overall trying to say. So I left them out. Maybe in a future collection! Q. What do you want people to come away with after experiencing your work? A. I hope people feel a sense of wonder. I want them to feel that they experienced some image or idea that was new to them, that their mind expanded a little bit, or that they’ve seen something from a different perspective. I also want them to be able to engage their emotions and have fun! 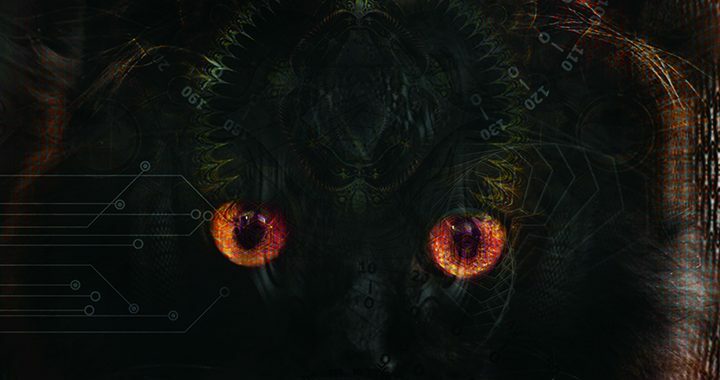 My debut novel, THE OUTSIDE, is coming out in June from Angry Robot Books. It’s a space opera with elements of cosmic horror, featuring an #ownvoices autistic protagonist and other diverse, non-neurotypical characters. It’s also a queer book – the protagonist is a lesbian and her supportive girlfriend is a major character. There are very few straight characters, actually. I’m watching the buzz build and I’m VERY excited. I’ve been struggling with burnout after finishing my PhD thesis, so I haven’t written as much new work as I’d like, but short fiction and poetry will always be there in some form. I have lots of ideas for THE OUTSIDE’s potential sequel, though it won’t be greenlit until we see how the first book does, and I have the beginnings of an unrelated novel involving dragons. I also am continuing my Autistic Book Party project, a long-running review series that talks in depth about representations of autism in speculative fiction. Autistic Book Party is funded through Patreon; the reviews are free for everyone, but backers help choose which books are reviewed, along with some other goodies. If that’s of interest, you can check it out at https://www.patreon.com/ada_hoffmann. It’s always a pleasure to talk with A utPress authors. Today we share an exchange between Azzia Walker, the operations manager, and Verity Reynolds. 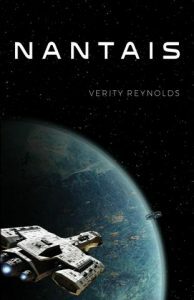 Stay tuned for Verity’s next book, and be sure to check out Nantais. What do your characters teach you? Since I began writing as a child, my characters have always done the one thing I was least allowed to do: have feelings and express them. So for years, they were the ones teaching me how to identify, process and manage my emotions. They’ve also taught me a lot about interpersonal communication; I can work out how conversations are likely to go before I actually have them. What was the feeling after finishing Nantais? Overwhelmed. Relieved. Terrified. I wrote a blog post about it at the time. Today, that blog post reads like the verbal equivalent of chucking pasta at a wall, which is a pretty good description of my feelings at the time, too. What advice do you have for a new writer? New writers are especially likely to want, not to write, but to have written. They want to be where published writers are, having written a book/play/short story/etc, and so they ask for advice for getting to the point of having written. But the only way to have written is to write, and writing is hard. It’s brutal. There are no shortcuts. Writers joke about this all the time; the #amwriting hashtag on Twitter is full of authors making fun of themselves for scrolling #amwriting instead of actually writing. So my advice to new writers is: You have to like the work more than being loved. You have to find something in writing that you only find in writing – not in having written, not in scrolling Twitter, not in skiing or changing your oil or serenading infants. Find that, and the rest will take care of itself. I’m slowly finishing the draft of Nahara, which is the sequel to Nantais. My brain is already onto the next book after that, The Ambassador, so I’m expecting the writing of that one to go fairly quickly. When I’m not at my desk, I’m working with Boundless, which is an Independent AA winterguard out of Battle Creek, Michigan. It’s our first year on the floor and we’re by far the smallest guard in our division, but the members are doing outstanding work. I’m also preparing for a concert with the Hillsdale Wind Symphony in May. And, of course, I’m always working on spoiling my spouse and our three cats. My spouse. My cats. Long walks in the woods (or, failing that, the treadmill) in which I don’t have to care what time it is or which deadlines are looming. And working with students, either in winterguard or in my spouse’s band program. The young people can get ON my lawn! Autonomous Press seeks submissions of poetry, short fiction, and short memoir pieces for an upcoming anthology, Spoon Knife 5: Liminal. Scheduled for publication in Fall 2020, this fifth volume of the Spoon Knife Anthology series follows The Spoon Knife Anthology: Tales of Compliance, Defiance, and Resistance (Spring 2016), Spoon Knife 2: Test Chamber (Spring 2017), Spoon Knife 3: Incursions (Fall 2018), Spoon Knife 4: A Neurodivergent Guide to Spacetime (Fall 2019). Deadline for submissions is Tuesday, December 31, 2019. A liminality is a threshold, the place between here and there which is, in itself, both and neither. From it we get the word “subliminal” meaning, literally, “below the threshold of sensation.” A liminal space is a transitional zone. It is at the heart of a ritual or rite of passage, when one is no longer the thing they started as, but has yet to become the thing they will be. To stand at a liminal point is to occupy both sides of a boundary at once. Liminality can be disorienting, unsettling, ambiguous, and uncomfortable, but it can also be freeing, an existence without labels or boxes, or a means to a new becoming. Andrew M. Reichart is managing editor of Argawarga Press, an imprint of Autonomous Press dedicated to genre fiction. He is co-author, with Nick Walker, of the epistolary science fiction novel Insurgent Otherworld and the Weird Luck webcomic. He has also written four genre-blurring novels, Wallflower Assassin and the City of the Watcher trilogy, which will be re-released in new editions by Argawarga Press starting in 2019. For his day job Andrew helps run a small utopian tech firm, and he’s also an activist with a grassroots abolitionist project. He lives in California with his wife and a couple of dogs. Dora M. Raymaker, PhD, is a scientist, writer, multi-media artist, and activist whose work across disciplines focuses on social justice, critical systems thinking, complexity, and the value of diversity. Dora is an Autistic/queer/genderqueer person living in Portland Oregon, conducting community-engaged research at Portland State University, knitting fractals, and communing with the spirit of the City. Dora’s work includes the novel Hoshi and the Red City Circuit and the short story “Heat Producing Entities” in Spoon Knife 3: Incursions. Submissions are now open. Please submit your work no later than Tuesday, December 31, 2019. Authors will be notified of their acceptance or rejection by Friday, February 28, 2020. Payment for accepted submissions will be 1 cent per word, to be sent by check during the second quarter of 2020. If you are anything like the AutPress team, the ideal present is a good book and time to read it. All month in February you can enjoy 15% off purchases with the coupon code HEART. Oh, it’s a good week over at AutPress. Azzia Walker, our Operations Manager, got to interview Fable the Poet on the making of art and how he shows up in the world. 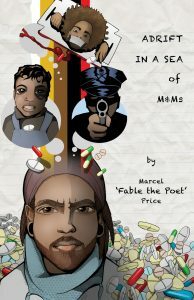 Be sure to check out Fable’s work in Spoon Knife 1 and his first solo poetry collection, Adrift in a Sea of M&Ms. Your poems are wicked powerful. Were they always coming out with so much honesty and force, or did you work at opening up that flow? Thank you for that! Honestly my poetry has not always been so raw, vulnerable, and transparent. I really started writing in High School (mostly in traditional Fables) as a way to vent about what I was going through at home and what I saw going on with my peers in a way that would fully make me vulnerable. Each year I can see, hear, and feel growth in my writing as I become more honest but also take steps forward in the caliber of my writing but for some reason as I progress it really makes me scared and I want to shut down and do nothing… But when I sit idle I get really in my head, so writing it is! What do you do outside of writing and performing that supports these? Do you have any practices or exercises that keep you centered and strengthened? I am lucky enough to be the Executive Director of a startup nonprofit organization called The Diatribe. The Diatribe uses performing art to empower young people to share their stories, raise awareness of social issues, and be active members in their communities. Our organization works with nearly 20 schools a year and if I am keeping it 100, the young people that we work with are one of my biggest inspirations. So many of our kids are so brave, honest, forgiving, and constantly working to become the best “them” that they can be. They subconsciously help me with my communication while constantly pushing me to become the best writer and leader that I can be. As of late I just purchased an Apple Pen and was gifted a book of 400 writing prompts from my mother. The Apple Pen helps as I have been one of those writers that has unfortunately distanced myself from writing in journals, but now I can still do that in my tablet (that is honestly always by my side) and these prompts are a big help as now I am writing nearly twice a week! Yay technology! When did you start writing and performing? How have you changed since gaining momentum in bringing your voice to the public? I started performing in High School and it changed my life forever. I actually became a writer because of a High School English teacher. I was failing her English class and after seeing some potential in me, she refused to just stand by and watch me fail. So she said to me “Marcel, if you turn in a piece of creative writing every day I will pass you” – me refusing to get grounded by my mother reluctantly agreed. At the end of the year she sent me to the KCP (King Chavez Parks) college readiness camp and although I did NOT get excited about higher education while I attended the camp, I did meet some workshop leaders that taught us about performance poetry. I read at the end of summer reading, next year at my High School talent show, and from that point on I was HOOKED. Honestly, my non traditional route into writing. My education, my story, and how I continue to evolve as a person but also a writer is a huge part of my “style” and I think many of my readers should know that when diving into my work. What advice would you have for an aspiring poet or performer who lacks confidence, and who may not have much support in place just yet? Do it, but do it for YOU. Do it when you have nothing else, do it and be more honest than you ever have before. Do it without any intent of anyone ever seeing it. But take baby steps into showing people your work and take every opportunity to do so that you can. If this is something you are passionate about, soak in as much information as humanly possible to make yourself better – but also realize that your “better” might not be someone else’s “better”. Remain true to you, find yourself, and really connect with the people who appreciate your work because they will keep you centered along your journey. Don’t make this “work” in the sense that you will ever regret going there. But also do not give this part time energy as full time hours breed full time results in every aspect of your creative endeavors. Azzia Walker, our new Operations Manager, had the great pleasure of interviewing Dora Raymaker, author of Hoshi and the Red City Circuit. Dora is a fabulous person to know and we recommend checking out more of her work. Who do you want reading your books? Most urgently, people like me. There are so few neurodivergent characters in literature–and of them, rarely are they heroes–and of those heroes, rarely are they portrayed outside of stereotypes. Rarely do they include the realities of our lives either, like the perils (and privileges) of passing, or the constant fight for person-ness and inclusion. I tell stories I want to read. I want them read by other people who wish, as I do, for realistic neurodivergent heroes, and for themes that trouble existing disability realities and narratives. But also, I want my books read by everyone who enjoys literary science fiction and a weird, fun romp through cyber-fueled speculative worlds! I’m not playing to the mainstream, but that doesn’t mean it wouldn’t be excellent to have broader readership. Definitely the chase scene that happens about mid-way through the book. I love writing action scenes, particularly chase scenes. Sometimes I act them out. That one was extra-fun because it gave me a chance to run through a lot of Red City, and I really enjoy walking through the streets of that setting and experiencing it with Hoshi. During the scene, I had to both get Hoshi from one physical location to another, and bring her from baseline to total mental and physical exhaustion. So it was a fun writing craftsmanship challenge too. What scene was the hardest to write, and why? 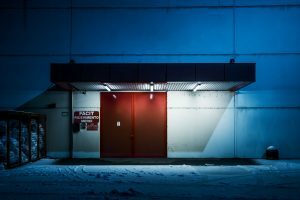 I wrote this story so long ago, I’m not totally sure anymore–the position of “hardest scene ever” is seared into my current memory as a particular scene from a different novel. For Hoshi though, possibly the Claudia’s apartment scene, which in the final book is scattered throughout the story but was originally one scene. That was structurally difficult–where to put what information and when? The other possible contender is the scene where Hoshi confronts the murderer, which remains the one part of the book I’m still not totally happy with. As to why that scene was hard, it’s because I feel like I never quite got grounded on the character of the murderer. It was “good enough” for the story, but not solid enough for me write without struggle. What feeling do you want people to come away with? Satisfaction at a story well-told, coupled with disappointment that it’s over and a desire for more stories with these characters, or in this world, or by me as an author. 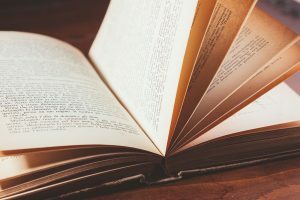 I want that feeling that I get when I read a good book, and turning the last page is a bitter-sweet sigh of satisfaction and yearning for more. Tell us something that we wouldn’t guess about you. When I was 17 I ran away from home with a friend. We made it all the way from Maine to Western Saskatchewan, and then back down into Eastern Montana, a distance of nearly 3,000 miles. That’s maybe guessable to anyone who knew me at the time, plus or minus some details, but the reason I was found was because a psychic who was sometimes used by the police back in Maine told my parents the name of a town which happened to be in the same area where the police picked us up. The Montana police would unlikely to have been on the lookout for us otherwise, and we’d have slipped away. So, yes, I was located by a police psychic. I was an actual X-File. Fable the Poet is in the news, as a spokesperson for poetry in schools and as the poet laureate for Grand Rapids. You can read three pieces by Fable the Poet in the original Spoon Knife Anthology and a full length book of poetry Adrift in a Sea of M&Ms. 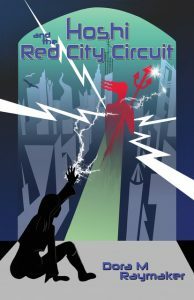 We hope you enjoy this review of Dora Raymaker’s Hoshi and the Red City Circuit. Michael Northen has great taste in books. 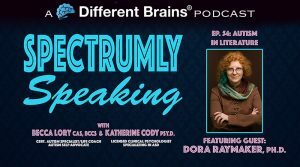 We’re delighted to share this podcast with Dora Raymaker, author of Hoshi and the Red City Circuit. She discusses the book and autism in literature in general. Let us know what you think!